I want a monitor of consumption for my house, and after catch it online, I decided to make one. I want use Arduino UNO with Ethernetsshield, and Cayenne. 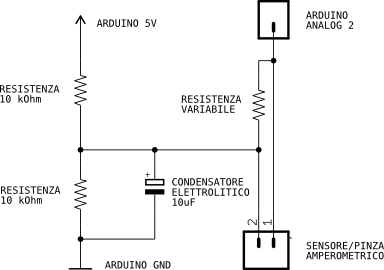 Arduino UNO is a famous microcontroller. Do you want one? Do you want know all about this? Follow the link (arduino.cc). Cayenne is a great service that give a platform to everybody that want make an IoT project. Cayenne is a service for IoT and also MQTT protocol with a great community, and a lot of tools. You can use Arduino UNO, Arduino YUN, Raspberry Pi, and more, for create your personal project. Sign Up now for free, and begin to experiment the many possibility. The SCT-013 sensor is a non invasive sensor that measure the Amps of one circuits. You can use the sensor for measure the current of your house. You can put the sensor on wire that outs by the main switch of house. See the circuits for preparing the sensor before connect to the Arduino UNO. You can open your account on Cayenne. Follow the link: Sign Up, and after add a device to your Dashboard. Click on Add new... Device/Widget. After you can click on Bring Your Own Device. Sign your credentials and after put this values on your Arduino Sketch code. Now it's time to put the code on your Arduino UNO. See the code on https://github.com/masteruan/Cayenne_Watt_monitor/... and download the Sketch. Put the code on your Arduino IDE or use create.arduino.cc, and upload the code. You must change the MQTT credentials values, and the values of your WiFi connection. Open the Serial monitor, and see the board connecting to internet and putting the data to Cayenne Dashboard. Open your Cayenne Dashboard, and see the value. You can See this value by using your computer, your Smartphone, or your tablet. The Dashboard is in the cloud. Yes, you can see the data wherever in the world. Now you can test your project. The Arduino UNO board reads the value of Watt, and puts this online through the MQTT protocol. This data is stored on Cayenne server that show the value on Dashboard. You can see the dashboard, and read the value of Watts directly, everywhere, every time and it's completely free! You can read the value in your browser, like if you are in your house. You can see my dashboard. If I switch on my oven, I can see changing the value of Watts on my dashboard. The value goes up until 2400 Watts. I can trigger this value. When this changes, and begin to goes up, Cayenne can send a mail to me, that inform me about the consumption. This is an information for make me aware of the power consumption of my house. It's is good for the planet, and for my wallet! Graduated in Psychology expert in new technologies and communication, with expertise in electronics, automation and home automation.